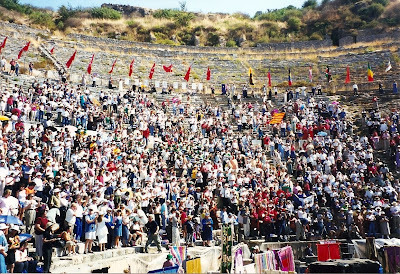 In 1999 I was privileged to be part of a group with 8 other people from Brighton Christian Church that went on a two week trip to Turkey and Israel to be part of C. Peter Wagner’s and Global Harvest Ministries worldwide call to meet in Ephesus, Turkey on October 1 for a concerted time of prayer and worship, called Celebration Ephesus. Our group was preparing for this event by meeting together during the summer in each other’s homes on a weekly basis for prayer and worship. We were meeting in our home on this particular evening of August 16. I should say at this point, that we were planning on touring the seven churches of the book of Revelation during the week of the concert engaging in what I would call prayer walking. In other words, as a muslim country, Turkey does not allow overt Christian preaching or handing out of materials, though we did pray and sing. In any event, our leader gave each of us a church to use as our prayer point; mine was Sardis. I read in Revelation 3:2-3 that God wanted the church to wake up and so, when my turn came, I prayed, “O Lord wake up the people of Turkey”! This was somewhere between 8-9 pm on August 16. The next day, the leader’s wife called me up and said, “Did you see what the headlines are saying? “The people of Turkey get a rude awakening”! Turkey is 7 hours ahead of Michigan (EST); in other words, at the same time that I prayed my prayer, a 7.8 earthquake hit Izmit, Turkey which is to the east of Istanbul. Thousands of people were killed and there was extensive damage in that area. While the area that we were going to visit was not affected, it was still a major catastrophe for Turkey. I knew that this event was going to be special!! Celebration Ephesus was the culmination of a year long project called Operation Queen's Palace. The primary focus of this project was to pray that the demonic entity known as the Queen of Heaven would let loose her grip over the region. Later on, as we toured the various church locations, we had no idea how many would show up when we got to Ephesus. "Moreover you see and hear that not only at Ephesus, but throughout almost all Asia, this Paul has persuaded and turned away many people, saying that they are not gods which are made with hands. "So not only is this trade of ours in danger of falling into disrepute, but also the temple of the great goddess Diana may be despised and her magnificence destroyed, whom all Asia and the world worship." Now when they heard this, they were full of wrath and cried out, saying, "Great is Diana of the Ephesians! "So the whole city was filled with confusion, and rushed into the theater with one accord, having seized Gaius and Aristarchus, Macedonians, Paul's travel companions. And when Paul wanted to go in to the people, the disciples would not allow him. Then some of the officials of Asia, who were his friends, sent to him pleading that he would not venture into the theater. Some therefore cried one thing and some another, for the assembly was confused, and most of them did not know why they had come together. And they drew Alexander out of the multitude, the Jews putting him forward. And Alexander motioned with his hand, and wanted to make his defense to the people. But when they found out that he was a Jew, all with one voice cried out for about two hours, "Great is Diana of the Ephesians!" "Last Friday, October 1, Christian pilgrims from around the globe converged on the small Turkish city of Selcuk for an event called "Celebration Ephesus." 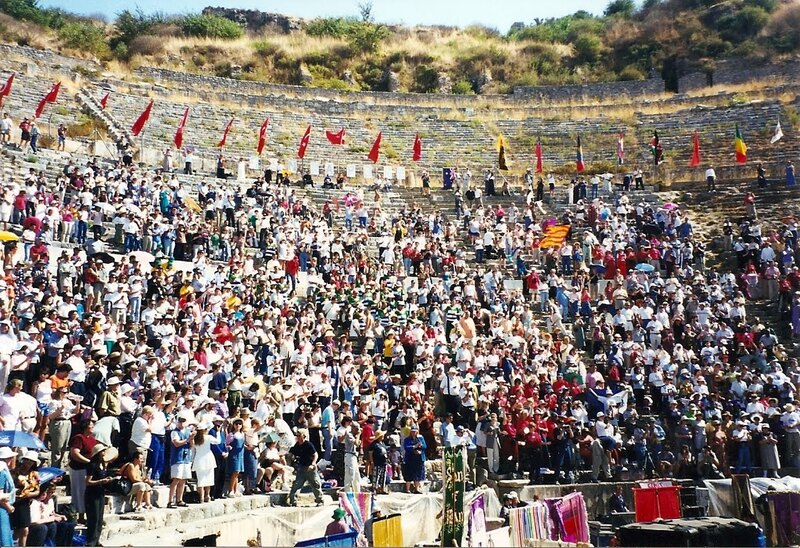 Approximately five thousand pilgrims met to sing, pray, and read scripture in the ancient Ephesian amphitheater. Protestant church members from Izmir, Istanbul, and Ankara also attended. The Church in Istanbul transported five busloads of believers to share in the occasion. During the four-hour affair, hundreds of curious tourists and Turks stopped to enjoy the celebrative atmosphere. Prayer advocate, event organizer, and World Prayer Center President, Dr. C. Peter Wagner, opened with a brief history of the celebration and the purpose of the gathering. Planned for nearly two years, the event was designed to focus on God's love for Turkey. What surfaced from months of prayer and planning was a visible expression of love for Turkish people in what was dubbed by many as "Love Turkey." As a point of orientation and identification with our hosts, Dr. Wagner drew attention to a line of Turkish national flags on the amphitheater apex. Seventeen flags unfurled in honor of the victims of the devastating August 17th earthquake--a somber reminder of a tragic loss of life. Centered among the flags, a small flag stood out in remembrance to the thousands of children lost in the quake. As an expression of love in action, many Christians came prepared with financial gifts for earthquake relief. The Protestant Relief Committee, a consortium of Turkish Protestant churches created to provide assistance to earthquake victims, received the $70,000 collected at the event. A local church leader from Izmir, Zekai Tanyar welcomed attendees to the event and read a prepared introduction in Turkish for attendees and the media. Five television channels and four local newspapers covered the event. Each newspaper published a half page report. Turkish national Christians reported that each media submission was "very positive." Event pastor, Rev. Ted Haggard of New Life Church in Colorado Springs, introduced the New Life Church choir, band, and the celebration schedule. A lineup of international Christian leaders offered prayers, read scriptures, and made declarations of devotion for what God had done and will do in Turkey. Brilliant banners illuminated by the afternoon sun provided a backdrop of color for the interpretive movements of a dance troupe lead by a Houston based ministry. A highlight of the Celebration was a folk dance performed by an ensemble from the Turkish Ministry of Culture in Izmir. Costumed in beautiful folk dress, the ensemble performed a folk dance for "the harvest." Culminating the performance was a vignette of a maiden rejecting the advances of her shepherd suitor--a prophetic symbol of the Church in Revelation 2:4 that had left her "first love." I was sitting right next to the delegation from Korea, so I can relate to that! Behind us, higher up in the stadium, I remember a Messianic believer waving an Israeli flag. It was an event I’ll never forget. Praising the Lord with 5000 people in Ephesus Turkey for 4 hours straight. Now I’m not claiming that my prayer caused the earthquake! But, when you’re part of an earth shaking event like preparing a country for a Gospel encounter, then interesting things happen. I thank the Lord and the people of Brighton Christian Church for the opportunity to be part of the action.